The first mention of an organ is in 1791, builder and specification unknown. 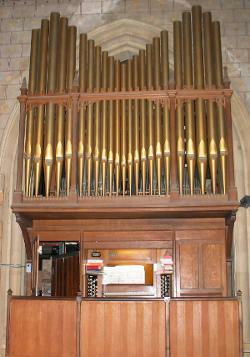 It was placed on the chancel screen and "its green and gold pipes were the object of much local pride". This small organ was moved to a West gallery in 1838, and enlarged by the addition of a Swell division and an oboe stop. This caused some concern as the organ partly obscured the West window. In 1868 the organ was moved again to the gallery on the North side of the chancel. At this time two octaves of pedals were added and the two keyboards extended downwards, the work probably carried out by W.G. Vowles of Bristol. With the advent of the present organ in 1898, this small organ was sold to All Saints Church, Viney Hill in the Forest of Dean, where it is still in use. Abbott and Smith of Leeds built the present organ in 1898 to a specification drawn up by Mr. G. Risley, Bristol City organist at that time. Designed as a three manual instrument, and completed as such at the console, only the pipework for Swell, Great and Pedal divisions was completed, owing to a shortage of funds. The Parish magazine of the time said "it is a beautiful instrument with every modern appliance and skilful mechanism. The frontage comes out of the arch of the organ loft so that the sound reaches through the Nave, but it would seem that the organist is perched on a rather precarious seat." This organ gave good service until 1963 when the Parochial Church Council were advised that it would be necessary to carry out a thorough cleaning and overhaul, and possibly to complete the third manual. Lionel Edmonds, organist at that time had helped to draw up a scheme for this addition but unfortunately died before it cou1d be carried out. An appeal was launched in 1964 and it was decided that the third manual should be completed as a memorial to Mr. Edmonds to mark his long and devoted service as organist and choirmaster. Work began on 19th May and was scheduled to last 10-12 weeks. In the end it continued until November. The organ was re-dedicated at Evensong on 22nd November. The first recital on the rebuilt and enlarged organ was given on 6th January 1965, by Cecil Adams, organist of Dursley Parish Church at the time. By 1990 problems were again occurring. Notes were not sounding and mechanism of both tracker and pneumatic actions were becoming very worn. The coupling mechanism of the Positive section had broken down, in effect isolating that division which sounded through the unglazed light above the War Memorial in the North aisle. This section eventually became totally unplayable for reasons we were to discover later. Urgent and necessary work to the building delayed the start of fund-raising for the organ, but this began in 1993. Coffee mornings, sponsored walks, concerts and donations from businesses enabled us to reach the halfway mark in November 1995, but still the start of any work seemed a long way off. Thanks to the promise of £12,000 from the Foundation for Sport and the Arts at this time, we were able to tell Percy Daniel & Co. Ltd., that they could start work when convenient. The total cost would be £24,500 and work began on 8th January 1996. It was discovered on the first day that there was damp on the Positive section. When dismantled it was a blow to find that rainwater had been penetrating the roof of the organ chamber for some time. The whole section would need to be dismantled and many new parts used before it would work normally again. This meant extra cost amounting to £4394. Fortunately our insurance policy covered this misfortune and the Ecclesiastical Insurance Group agreed to cover 75% of the cost. Tracker action to the Great and Swell will be renewed, while the Pedal and Positive action will be converted to electro-pneumatic. A new draw stop is to be added enabling the Great and Positive to be connected electrically, and so the whole organ will be playable from the Great. At the time of writing (April 1996) the organ is still dismantled and we still need to raise £4168.